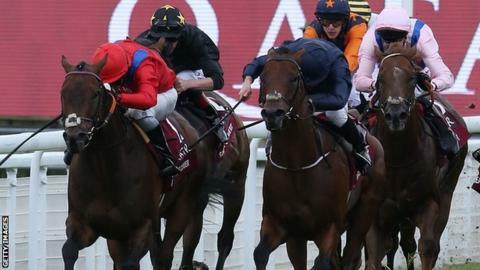 Take Cover and jockey David Allan won the King George Stakes at Glorious Goodwood. The 8-1 shot led almost from the off after a strong start and held off the challenge of Washington DC to win the race for the second time. The nine-year-old, trained by David Griffiths, also won the race in 2014. Earlier on, favourite Franklin D and jockey Ryan Moore won the Betfred Mile by a head from 20-1 outsider Master of the World. Allan, speaking about the victorious Take Cover, said: "He's just got raw speed and he really battles to the finish. "He loves to get on with it, but when something comes at him in the finish, he doesn't half dig in. He's still improving, I think." "There's no more fabulous a spectacle than a front-running speedster like Take Cover blasting out of the starting stalls, straight into the lead, at an unfeasible looking fast pace, and managing to keep it up all the way to the finishing line. Here, the winner clung on in 56.86 breathless seconds. "That thrilling style and a longevity which sees Take Cover still going strong at nine - he's been second in this, beaten a head, as well as successful twice - only adds to the popularity of this type of horse. A real credit to a little-sung trainer, David Griffiths, and his team."